I came to know Luisa Weiss as you may have, through her site, The Wednesday Chef. I wish I could say what post was the first I devoured, or the recipe that was our introduction, but I can't. She's one of those people who seems as though they were always around. I do remember thinking her perspective was unique; born in Berlin to Italian and American parents, she was a woman who had studied in Europe and the United States, who loved food and now worked in cookbook publishing. She lived in New York. She seemed as sharp as she was kind, with a cracking streak of sarcasm and a real vulnerability. I thought her a little glamorous. What sold me though was Luisa's impressive talent; she's got a knack for both words and recipes. She can line up a phrase in such a way that it comes across as both succinct and artful. She's a genius at sussing out good recipes, and specific and honest when it comes to analyzing the bad ones. As Luisa continued to write, her circumstances changed and her skill evolved; the recipes were the way she talked about everything else in her world. Her highs and lows were shared over baked beans and Greek salads and pommes de terre boulangère. Now, she has a book that covers all that more. And it is a Los Angeles Times bestseller. When Sean and I packed up the boys for a late August jaunt to Montréal, Luisa's was the only book I tucked in my bag. It made for perfect travel reading, especially as we were going back to the city where I was born, and where Sean and I have spent so much time, starting from when we were dating. As Luisa recounted the journey she's had thus far, one divided into countries and continents, it made me consider my own. I'll not spoil where her words leave off, but she sets us in an idyllic point of beginning and end. It is a moment filled with an appreciation for how we are in the constant collection of layers to our lives, how we are always building up these stories, memories, of people and places, adding and taking away from the patina of experience. She considers the complex, messy choices we make in the pursuit of growth and happiness, and shows a heartening faith in forward progress. I thought a lot about my parents on that trip, how it must have been for them, as they started out in a new country. I conjured younger versions of Mum and Dad in shops and restaurants, I tried to find places that felt familiar from my childhood, and I wanted to stand on the steps of the church where they married. I wondered what it must have been like to make the choices they did. One evening after dinner, Sean and I walked with our sons through Parc La Fontaine. The light was gold and gleaming, and the shadows long on the grass. We ambled along the winding paths and listened to someone playing violin. I held Benjamin's hand, and Sean carried William on his shoulders until we reached Sherbrooke street. At that point, facing south, you're at the edge of the plateau, with its width to your back and the mountain rising from there. The road falls away at your feet, rolling down towards the port and waters at the city's southern border. There was something in that moment that felt like potential. I imagined us living there. If I squinted hard enough, I thought I could see the boys running up the stairs of one of the skinny Victorian houses that line the park, I could hear the jingle of keys in my pocket, and I felt for a moment we could be home. I just finished My Berlin Kitchen for the second time, proving that the book doesn't require travel. I read it one afternoon, as I sat securely tucked on our couch, and Luisa's sentiments still rang pure and true. The next day, I made these meatballs for the third (fourth?) time, with her conjured company in the kitchen. 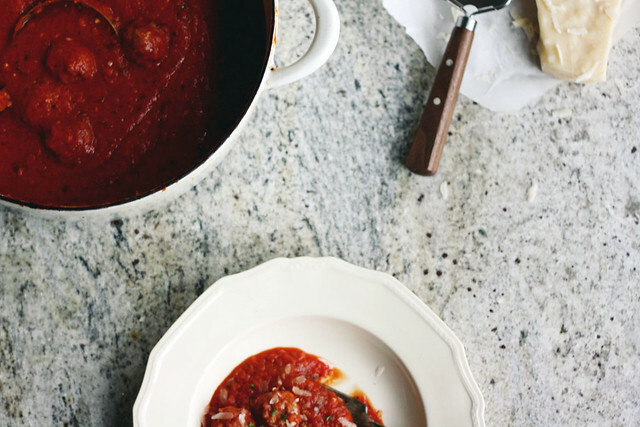 These meatballs aren't in the book, — there is however, a recipe she includes for meatballs in chipotle sauce that should be mentioned, and one for a classic ragù that is the closest I've ever come to the Platonic ideal. Luisa actually wrote about these meatballs right before My Berlin Kitchen was published, as mother to a newborn son. They serve as a poignant epilogue to Luisa's story. She's already on her next chapter, and it's nothing short of wonderful to see her on her way. Recipe rewritten from Luisa Weiss. I find it as easy to make a large batch as it is a small one, so I often double the recipe, which guarantees that I'll have some to stash away in the freezer. See below for notes on that. What do I like to eat meatballs with? Luisa says she likes hers with polenta or rice, and I'm in complete agreement with both of those recommendations. To add one of my own, I suggest you toast a slice of really crusty bread, then rub the cut side of a garlic clove over its surface. Tear a nice, milky ball of buffalo mozzarella and smush that into the bread. Ladle on some meatballs and sauce, snip over some fresh basil and a few chili flakes. Toss together an escarole salad, and nestle a handful of leaves beside the meatballs on the plate. Then grab a knife and fork and go at it. This deconstructed meatball sandwich makes for a rustic bit of business; with the bread both soft and crunchy, and then the mozzarella will be cool in some bites and melted in others, and the sharpness of the escarole stands out against the richness of the meat. Most likely at some point there will be sauce dribbling down your chin, which I consider undeniable proof of a good meal. Tear the bread into a bowl and soak the pieces with the milk. Allow to sit for a few minutes. Using your hands, squeeze out the bread and add it to a large bowl, along with the ground beef, ground pork, eggs, salt and pepper, maybe 30 grates of nutmeg, and the minced parsley. Again using your hands, gently mix the all the ingredients together until they're a smooth, uniform mass. Cover the bowl and chill in the refrigerator for at least an hour. An hour or so before you want to eat, make the sauce. In a large, heavy-bottomed pot, brown the garlic in the olive oil over medium heat. Pour in your tomatoes, give everything a stir and a good pinch of salt. Reduce the heat to low, and simmer the sauce for 25 minutes, stirring occasionally. Once the sauce is cooked, taste and adjust the seasoning. To cook the meatballs, gently roll the meat mixture into smallish balls and line them up on a plate or baking sheet. (Luisa likes her meatballs about 2-inches in diameter, I like mine a bit smaller — see note below.) When all your meatballs are ready, carefully drop them in the warm sauce. Cover the pot with a lid and leave it to simmer. Resist any compulsions to stir the pot; but, as Luisa says, if you're concerned you can shake the pot a little. After 25 minutes, the meatballs will be ready to eat, or you can allow the pot to cool completely then freeze everything for another day. Before forming the meatballs, pinch off a small amount and quickly fry up a little patty to check seasoning. It's an especially good thing to do when making large batches. When the butcher has some on hand, I'll often add some ground veal to the mix. 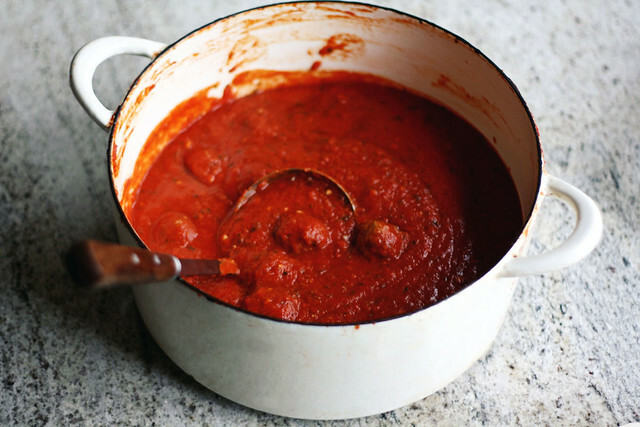 If there are too many meatballs to fit into your pot of sauce, you cook the remaining meatballs seperately. I preheat the broiler to high, then pop in a baking sheet of meatballs about 3-4 inches from the heat. My smaller meatballs (1 heaped tablespoon of mix per ball) take around 8 minutes to get well-browned on the outside and cooked through. I allow the meatballs to cool, then freeze them on the sheet, transferring them to a sealable container for storage once frozen.